Address: 7625 Pecs, Kalvaria u. 58. The hotel has 38 rooms. You can find Hotel Millennium in the historical city centre of Pécs, 5 minutes walk from the Széchenyi square. 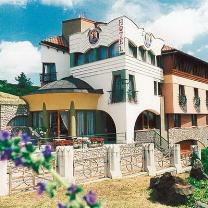 The Hotel was built on the south part of the Kálvária hill, in the middle of a reserve. In the neighbourhood of the hotel there are lots of museums and monuments. It was built by the plans of Sándor Dévényi, Kossuth- and Ybl-prize winner architect and opened in the October of 2000. All of the rooms meet the requirements of a 4-star hotel. All rooms are furnished with bathroom, minibar, telephone and TV. Exchange, Rent a car, Lift, Laundry, Roomservice, Internet connection. Bathroom, minibar, telefon, TV in every room. Pets acceptable.